Sydney Shop Girl: Crofton Cast Iron - Cheap, Chic and Rather Good. 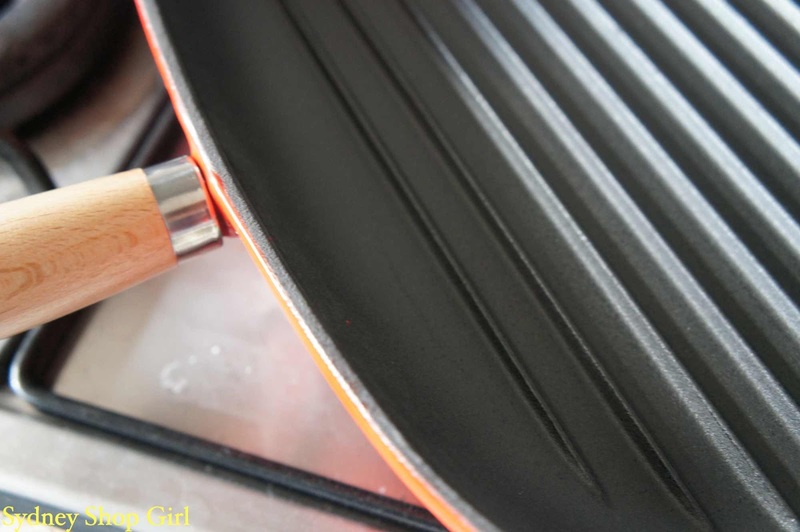 As I unboxed my Crofton cast iron grill pan ($14.99 special buy from last week's Aldi Special Buy Wednesday), a few thoughts crossed my mind. The first being scepticism that what I was holding in my hands could in any way compete with the $200 plus equivalent from Le Creuset. The second was more of a stern telling off to my spendthrift self. What was the point of buying all that Le Creuset in the first place if it ends up just sitting on a shelf in the kitchen looking very Donna Hay because you're too scared to use any of it in case you stain or chip the enamel? The self analysis bit of that paragraph is beyond the scope of this post, so let's get on with it. 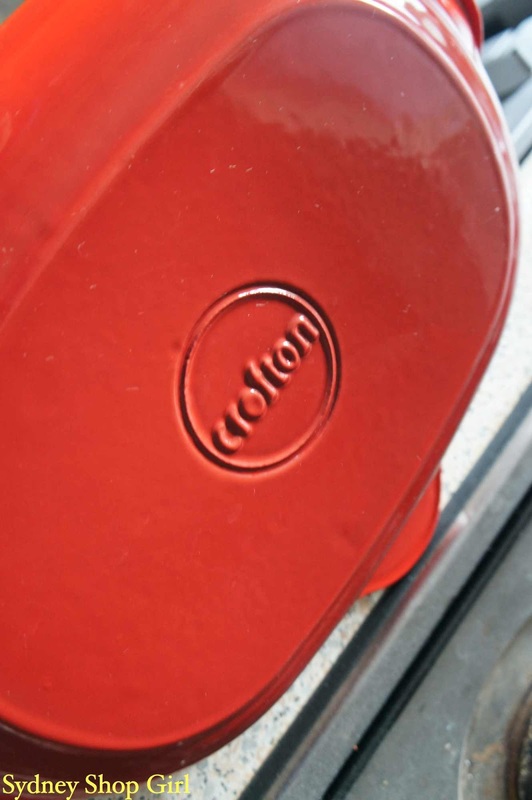 I love the range of colours that the Crofton cookware comes in. Each item in the range is available in white, blue, green and red. Prices range from $14.99 for the grill pan or fry pan up to $18.99 (or perhaps it was $19.99) for the casserole or crock pot. The 1.6L saucepan comes in at $16.99. Each piece comes with a five year guarantee. I like how the grill pan has a rim to it as well as an extra handle and spout. The size of the pan also sits well on my four ring gas burner. 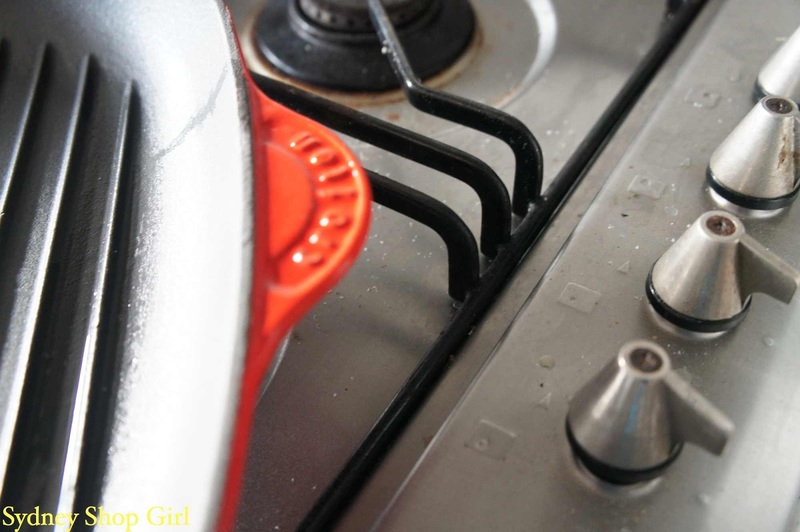 The cookware is safe on gas hobs, electric hobs, ceramic and induction stoves. While the crock pot and casserole have cast iron handles, the grill pan, fry pan and saucepan all have wooden handles. The wooden handles are solidly attached and have the advantage of not getting as hot as an iron handle would. They also make lugging your cooking implement around a little easier on your back and shoulders. The enamel finished surfaces feel as strong and smooth as the pricier competition. The difference between them though is in the cast iron cooking surface inside. The Crofton make is definitely rougher to the touch and the iron / enamel interface not as neatly finished. There are also minor ireggularities along the ridges of the grill. It's not really going to affect cooking performance and given the price point, I'm not too fussed. 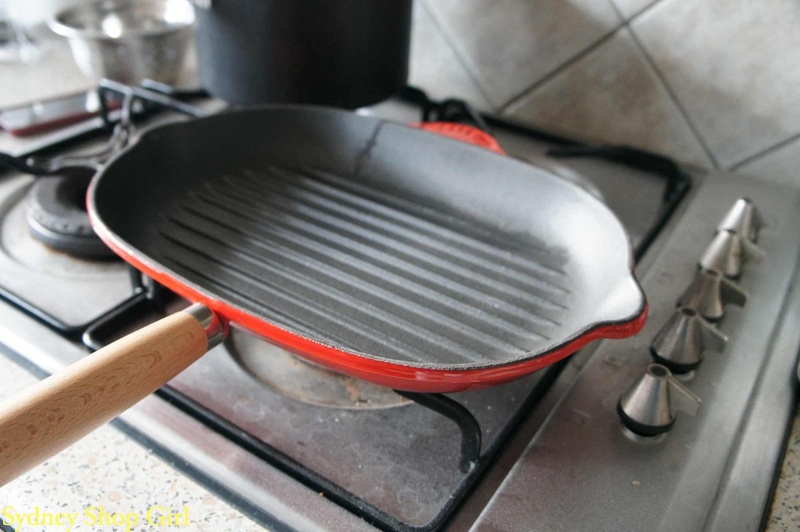 The instruction and care booklet mentions that rust can occur on edges but that this can be prevented by making sure cookware is allowed to dry fully before being stored. Underside of the grill pan before its first use. Hope it stays this way forever. I was too impatient to follow the seasoning instructions as suggested by the manufacturer. The idea behind seasoning is to reduce the amount of food sticking to the grill plate when cooking and also to prolong the life of the pan. 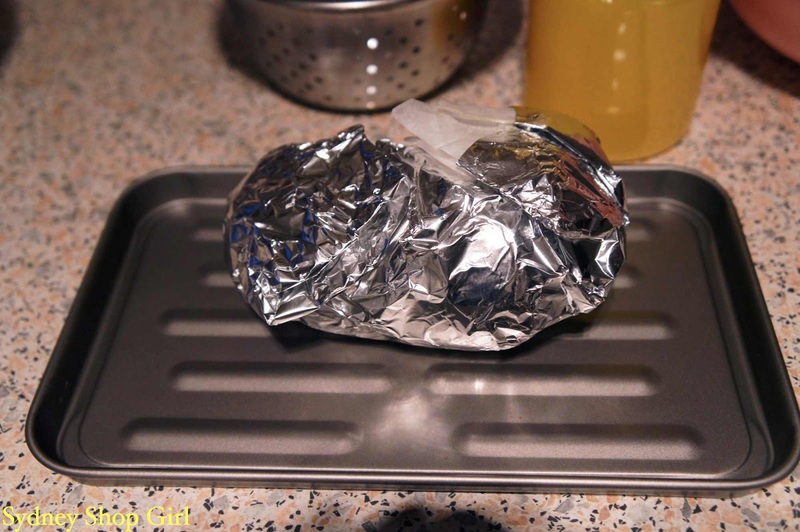 You're meant to warm, oil, heat, wipe off and repeat three to four times over a low flame. 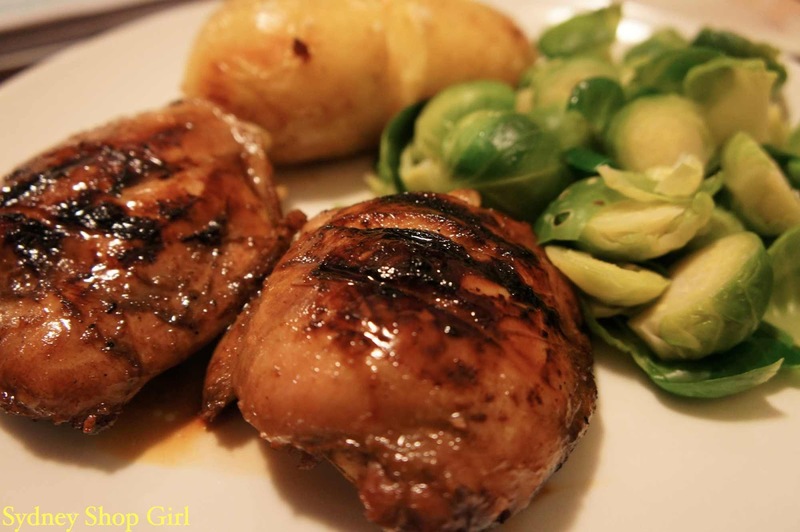 I went through the cycle one and a half times before greedily grilling my honey soy chicken. As with all cast iron cookware, I used a low heat and allowed the grill to warm up gradually. The pan was easy to use and because of the rim, I didn't lose any chicken to the stove top like I usually do with those rimless grill plate arrangements. The weight of the pan ensured that heat was distributed evenly and there was no precarious wobbling as I cooked my chicken. This is how my chicken looked after being grilled. Not bad for a girl who usually ends up with a charred bit of chook with chunks of flesh sacrificed to the grill plate. Taste wise, I really rate the version of honey soy marinade I linked up to earlier. The lemon juice leaves the chicken incredibly tender even at the hands of an over griller like myself. So easy and so much better than store bought. Daiso baking tray - $2.80. My baked potato comes to this post courtesy of my baby baking tray from Daiso. There was always going to be charcoal left behind on the grill. Especially because my marinade contained a fair bit of honey. I needed to soak the grill overnight in hot soapy water before tackling the resistant bits the next day. Not everything came off but I noticed that once the pan dried out completely, most of the charcoal flaked off pretty easily. It's early days yet but there wasn't a scratch on the enamel of the base despite my dragging the pan across my rough as nails, ancient hob. Yay from me. The minor inconvenience of having to give the pan extra attention when cleaning it is something I'm prepared to deal with in the context of the overall package of a good looking and well made piece of bargain priced cookware. Also, given the rough cooking conditions I'll be putting my grill pan through, I won't feel as upset if my $15 Crofton pan collects some stains and scratches as opposed to a $200 Le Creuset one. There's still a decent range of colours and styles in most Aldis at the moment, so if you're interested, duck in tomorrow. I bought the exact same grill pan and have used it nearly every day for about 6 weeks. What I've found is that part of the wooden handle near the pan has gradually gone a black colour and has gradually turned to charcoal. As a result the handle is now lose. I can't tighten it any more as there is nothing left to tighten ie the wood has become charcoal. So when I pick the pan up by the handle the metal cooking part rotates while I hold the handle still. I also bought a crofton fry pan and the same thing is starting to happen to that. I have a green shallow casserole pot from Aldi and I like it, but the paint has chipped from use. Well done on your grilling skillz. Hot soapy water on cast iron is a terrible idea.